Summary: Researchers have successfully reconstructed a short movie of randomly moving discs produced by rat retinal neurons, with the help of machine learning technology. 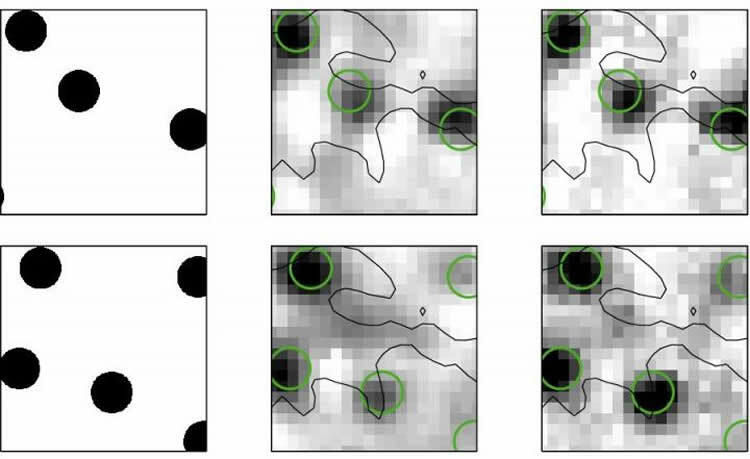 Reconstructing a video from the retinal activity. Left: two example stimulus frames displayed to the rat retina. Middle and right: Reconstructions obtained with two different methods (sparse linear decoding in the middle and nonlinear decoding on the right). Green circles denote true disc positions. NeuroscienceNews.com image is credited to credited to Botella-Soler et al. Image Source: NeuroscienceNews.com image is credited to Botella-Soler et al. Original Research: Open access research for “Nonlinear decoding of a complex movie from the mammalian retina” by Vicente Botella-Soler, Stéphane Deny, Georg Martius, Olivier Marre, and Gašper Tkačik in PLOS Computational Biology. Published May 10 2018. PLOS”Video of Moving Discs Reconstructed From Rat Retinal Neural Signals.” NeuroscienceNews. NeuroscienceNews, 11 May 2018. PLOS”Video of Moving Discs Reconstructed From Rat Retinal Neural Signals.” http://neurosciencenews.com/disc-movement-rat-retina-9029/ (accessed May 11, 2018). Retina is a paradigmatic system for studying sensory encoding: the transformation of light into spiking activity of ganglion cells. The inverse problem, where stimulus is reconstructed from spikes, has received less attention, especially for complex stimuli that should be reconstructed “pixel-by-pixel”. We recorded around a hundred neurons from a dense patch in a rat retina and decoded movies of multiple small randomly-moving discs. We constructed nonlinear (kernelized and neural network) decoders that improved significantly over linear results. An important contribution to this was the ability of nonlinear decoders to reliably separate between neural responses driven by locally fluctuating light signals, and responses at locally constant light driven by spontaneous-like activity. This improvement crucially depended on the precise, non-Poisson temporal structure of individual spike trains, which originated in the spike-history dependence of neural responses. We propose a general principle by which downstream circuitry could discriminate between spontaneous and stimulus-driven activity based solely on higher-order statistical structure in the incoming spike trains.